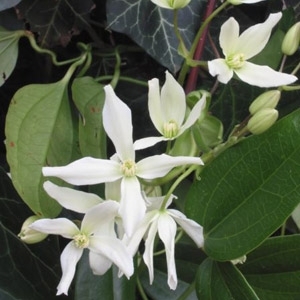 Clematis armandii is a spectacular evergreen vine that is beautiful whether in bloom or not. Clematis armandii has much to recommend it including beautiful evergreen foliage and delightfully fragrant flowers that appear in late winter (with occasional blossoms throughout the summer). Even better, this vine is not bothered by pests, is tolerant of shady conditions and, once established, needs little care.